Could this be The Final Straw for Street Food? #BeFantasticDitchPlastic is our new campaign which has received a brilliant uptake and response on Twitter, if you’re not on Twitter, then you will perhaps have missed this or maybe even heard about it on the street food vine. We are advocating a complete ban on plastic straws in the street food industry, with many large food retail chains already implementing this ban, we feel we should be doing the same in our network. Some may say it’s too expensive, it’s actually the opposite, it’s saving you the cost of buying them altogether. Suppliers are creating some really funky designed paper straws and there are even edible ones out there. Should you wish to join us in our ditch plastic campaign or just want to find out more about street food in general, follow us @Streetzine on Twitter, if you don’t use Twitter, you’re missing out on so much #StreetFoodNews in the UK and the rest of Europe. Our co-founder Diane Mason is active daily on Twitter to answer any questions, so you really do need to get twittering soon. The platform is also a great way of gaining new business opportunities within the street food industry and a must for marketing your business to a specific audience. It’s free and easy to use, so if you’re reading this and running your own mobile catering business or you’re a supplier and not yet on Twitter, we look forward to you following us on our social media channel and using our daily Twitter feed as an essential resource for your business. If you’re not feeling the love for social media then fear not on missing out altogether, we are having a new feature starting in issue 118 of our e-newsletter. If you aren’t already subscribed to our newsletters, just enter your details in the box at the top right of our news feed on this page. If you do follow our Twitter feed @Streetzine you will no doubt be aware of our recent campaign to encourage all street food traders to #BeFantasticDitchPlastic in their business wherever possible, in an industry like ours, we are responsible for a massive amount of one-use waste. The continual rise in street food demand throughout the UK and the increase of food based events has without doubt added dramatically to plastic waste in the outdoor catering sector. However, on the flip side we know many of you reading this have been environmentally conscious for some years now, take ‘Dead Good Burrito‘ for example who trade at Street Diner in Brighton, they have been plastic free for over six years. If you offer a discount to customers who do actually bring their own eating / drinking vessel, get it on your chalkboard \ menu board, website and tell your customers, knock off the cost of the packaging and portion out same size as your usual packaging and not to the size of vessel they bring. Street food event organisers – would you consider providing an option of purchasing a reusable plate to your public guests and encourage your street food traders to offer a discount to #BeFantasticDitchPlastic supporting customers? …. Have a stack on each stall and the deposit could be added at the point of sale on first purchase, all plates and reusable cups returned will carry a value of say £1.00 each for example. Anyone adopting this scheme is welcome to get in touch with us and be featured in our #BeFantasticDitchPlastic campaign. Levenshulme Market has adopted a scheme to reduce plastic waste in the Levy Market Bar with their reusable glasses. Our partner NMTF, who’s membership we endorse are also behind all of their 26,000 + members getting involved to become more eco-friendly in their businesses. The pic below shows NMTF President John Dyson back in the 1990’s, notice the banana boxes? He still uses some of them seen in the photo to this day! Real Food Festivals’ Canopy Market has adopted a reduce plastic waste ‘#RefillNotLandfill‘ strategy for their events. Birmingham’s Hawker Yard has also ditched using plastic straws since last Christmas throughout all of their events. Together we can make a difference and help to reduce the huge amount of plastic waste in this sector. These are just some of the strategies which when implemented by an industry such as ours where the spotlight is shining on our disposable food packaging waste, there has never been a better time or opportunity for us to unite in the campaign to #BeFantasticDitchPlastic. Follow our twitter feed @Streetzine for tips and information on how to be more eco-friendly in your business and use the hashtag #BeFantasticDitchPlastic to shout about your eco-credentials and get featured in our news feed. 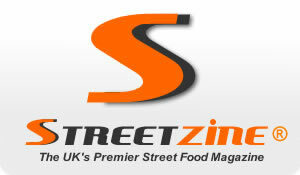 Or alternatively, contact diane@streetzine.co.uk for further information. It’s heart warming to see your positive moves to reduce single-use plastic in mobile catering. Great constructive advice. Good luck with the campaign. Our SeaStraw pledge had garnered 40 businesses to switch, including several street foods traders and mobile bars.